It could be proof that walking is quicker than driving in York city centre. Or that it isn’t. It could be proof that too many people drive along Gillygate and Bootham. 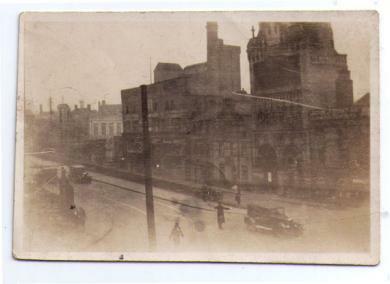 Or it could be proof that the traffic lights at that junction are badly organised. Or that they’re deliberately set to annoy drivers so that everyone will give up trying to drive up Bootham or Gillygate. It could be proof that on sunny Sunday afternoons most residents don’t want to go into the centre of York but would rather be stuck in traffic on the A64. 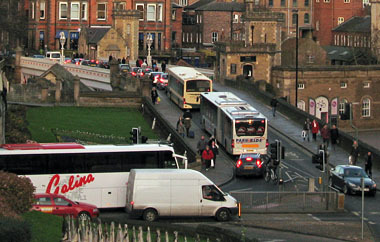 It could be proof that Lendal Bridge isn’t actually a particularly congested place after all. It could be proof that Bootham and Gillygate are almost always congested and therefore you might ask whether the Lendal Bridge restrictions will help with that or make it worse. There’s no such thing as ‘the truth’. There are different truths. There’s also, increasingly, skilled manipulation of the facts to suit particular agendas. The agendas only matter really if they’re the agendas of the people with the power, eg local authorities, wealthy investors. The rest of us, we’re just thousands of small journeys, making our way across and around the city. But many of us, me included, are suddenly a lot more interested in traffic flow. Today I saw two photos posted online taken by pedestrians. 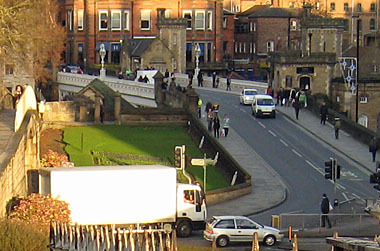 One at Lendal Bridge, showing it looking just as it used to do, before the trial, with cars and vans travelling along it. Presumably because the message hasn’t quite got through and people haven’t seen the signs or haven’t understood them. The other showed a traffic-free Gillygate. They were taken by two different people about 20 minutes apart. I found it interesting and amusing that a traffic-free Gillygate was taken as a sign that the bridge trial was working, while the photo from the bridge appeared to reveal that everyone was ignoring it and driving across as normal. Some things can be scientifically measured of course, already have been for some time, like pollution, at certain points in the city. It’s also true that all the data gathered can be and no doubt will be interpreted in different ways. I think most York residents believe that whatever happens the bridge restrictions will remain. It seems that a central concern is to look impressive and brave to people beyond the city, to get attention for doing things that grab the headlines elsewhere and get the city noticed. And to put a positive spin on everything, regardless. I’ve found it interesting that there’s been more focus on air quality on the bridge, as if this was the main point of the exercise. The leaflet delivered to households had absolutely no mention of pollution or air quality: it seemed to be all about how things looked. Maybe worth mentioning though that one of its ‘Did you know?’ points was ‘many more people cross Lendal Bridge on foot, bicycle or bus than drive over it every day’. Yet now we’re seeing suggestions that somehow it was a smog-filled hell suddenly transformed into clean-air heaven. I hadn’t given much thought to the automatic fines that would be incurred, and it seems that motorists haven’t either, as many are still driving over the bridge as normal. Aren’t people who are about to be charged a fine supposed to be given a clear advance warning of this? And why wasn’t the whole trial presented with this as the headline, rather than the whole ‘closure’ or ‘trial’ thing? 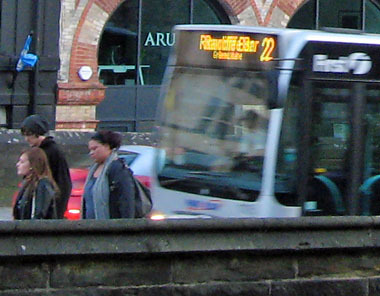 Why wasn’t it presented as ‘congestion charging about to begin on Lendal Bridge’? As that’s what it is, isn’t it? Or not? The ‘congestion’ may be open to question, but it seems there’s definitely a charge. So are we welcoming visitors with our big ‘unclogged corridor’ of grandeur or are we thinking ‘good, let’s get a load of confused drivers on the bridge and then get their dosh before they’ve even got to the shops’? The inaccurate descriptions of the thing haven’t helped. I’ve seen people refer to it as pedestrianisation — it clearly isn’t, and anyone who thinks it is is likely to be rudely awakened from their idyllic wanderings by a looming bus, taxi or cycle. Or perhaps a bin lorry, or a Royal Mail van, or that NRM road train mentioned earlier. Because one of the things that has come to light, aside from the lack of clear signage, is that these other categories of vehicle are also exempt from the restrictions. There are probably others by now, it looks like we’re making it up as we go along. And if there are these exemptions, why those and not others? Apparently minibuses aren’t allowed through, though buses are. Blue badge drivers aren’t allowed through, which seems particularly indefensible. If someone already has difficulties with access, why would a local authority think it reasonable to increase those difficulties by sending them on a long detour? I think I’d just give up coming in to town and go to Monks Cross instead. I heard an interview on the radio suggesting that funeral processions aren’t included in the exemptions, and that this would affect funeral services at the churches in the vicinity. It would mean, I guess, that either the cortege trails its way round the roads on the outskirts, going the long way round, or the fine is added to the undertaker’s bill. Either way, it can’t be right, can it? I’m hoping I’ve misunderstood or misheard, as it would mean a mindset exists I really don’t want to believe exists. The dead can’t really get on a bike, can they. And of course if Richard III ends up getting buried in York Minster his cortege wouldn’t incur a charge would it. Some are more equal than others. That’s the worst thing about this experiment, as we get into the detail of it. What it says, about who is welcome and who isn’t, whose journeys are considered important and whose aren’t. Some of the people being inconvenienced by this really shouldn’t be, they’re ordinary hard-working people doing a range of jobs which depend on using their own transport. Or people with mobility difficulties. Or indeed, dead residents. Maybe we could transport their coffins to the churches on one of the vehicles with special privileges — the NRM road train perhaps, that goes at a suitably slow pace. Like I said before, I’ve no need to drive over Lendal Bridge, or indeed anywhere. But that doesn’t stop me noticing the issues involved, the confusion, value judgements, lack of information, and spin. This ‘trial’ is just one part of ‘Reinvigorate York’, as the ‘Lendal Bridge Trial’ leaflet makes clear. This transformational programme continues on its journey, obsessively decluttering the streets, except where it needs to put up new road signs on the theatre advertising the Lendal Bridge changes (which no one can see past the buses parked there). And next stop King’s Square, with far more permanent and damaging effects, including the felling of a tree. All facts are correct to the best of my knowledge at the time of posting this page. If not, please add a comment and I’ll amend accordingly. I’ve no wish to add to the massive confusion already out there. Your comments are measured and thoughtful as always. Thank you. It seems to me that so much of this upset could have been avoided if the City Council had been open and said they were going to trial closure anyway but that they would work with the citizens on monitoring criteria and success and fail targets. If we as a community had contributed to these measures and targets, and if the council had opened a new portal where we could all see the trends in the metrics and give open comments- I can’t help but feel that this would have made the whole exercise more palatable. Like you I don’t need to drive across the bridge often, and in my heart of hearts I would like it to work – but not at the expense of the residential areas where York taxpayers live. Without proper published metrics I am afraid I have lost confidence and trust in the Council to deliver a fair resolution to this trial. I agree with the growing sentiment that the council is prioritising visitors against us residents, seen also in the recent no alcohol zone where street drinking is now pushed out to the residential areas, especially the social housing estates. I’m glad you mentioned the suggestion I’ve also seen that it may end up being a 7am-7pm ban – and if so it’s hard to see how the current trial will provide relevant information. There are so many aspects of it which don’t make sense, which is why I feel I’ve turned from being open-minded when it was first suggested to feeling completely cynical about it all. Thanks for your comment and insight. I really am interested in how other people are seeing all this, and also in the impact it’s having on other roads. The impression I’m getting from Press comments and Twitter is that other roads are more congested. Which means York residents have more pollution outside their homes. I am a nurse living in North York and working in West York, the fastest (approx 25 mins) and most fuel-economical route for me is to go via Lendal Bridge, due to shift start/finish times I now have to go via the Barbican and through Foss Islands or Heworth/Tang Hall. It now takes me nearly an hour and most of this is the congestion at Blossom Street/Skeldergate Bridge/Walmgate Bar. The petrol stations must be selling more! The only plus is that the buses through my village seem to be running on time for once. Thanks for your comment Kelly. I don’t think it’s fair on you at all, and the increased fuel costs is something I was wondering about too. While I appreciate the huge problems this causes for the taxpayers of York I fail to see any benefits to visitors. 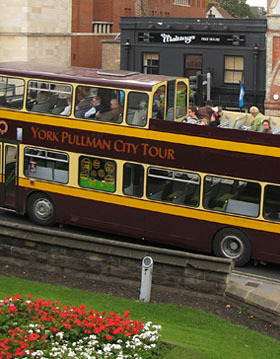 ‘Come to York and pay £30/60/90 for the privilege’ is not conducive to anyone, the visitor attractions are already quite expensive without the added highway robbery for anyone innocently using the inner ring road to get from the north to the south side of the river. I can vouch for quite a few people who will not be visiting again and certainly one frequent visitor in the process of setting up a business who will taking his clients elsewhere.